ACE is committed to providing clients with products and services that meet their expectations, whilst upholding applicable legal requirements. Our integrated suite of Management Systems are designed to meet the requirements of AS/NZS ISO 9001:2008 Quality Management Systems which ensures that the quality of our products and services is consistent. 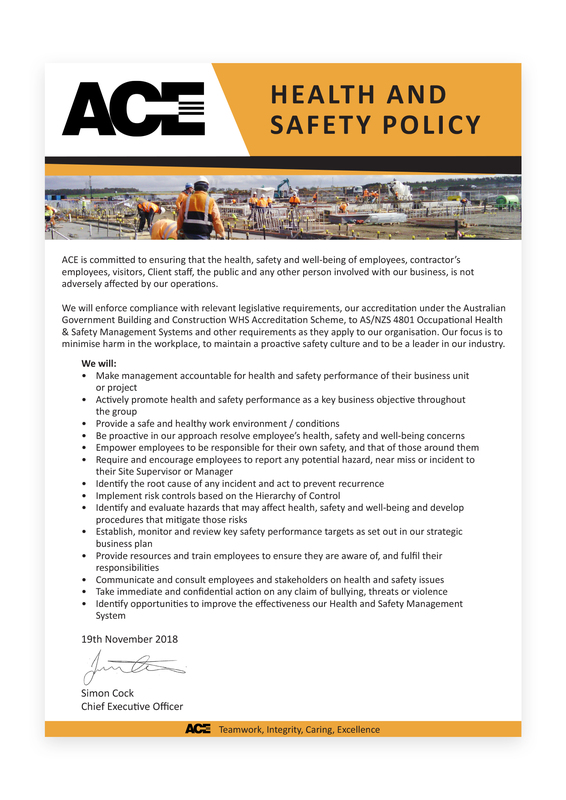 ACE has a legal duty of care to provide and maintain a working environment that is safe and without risk to health. 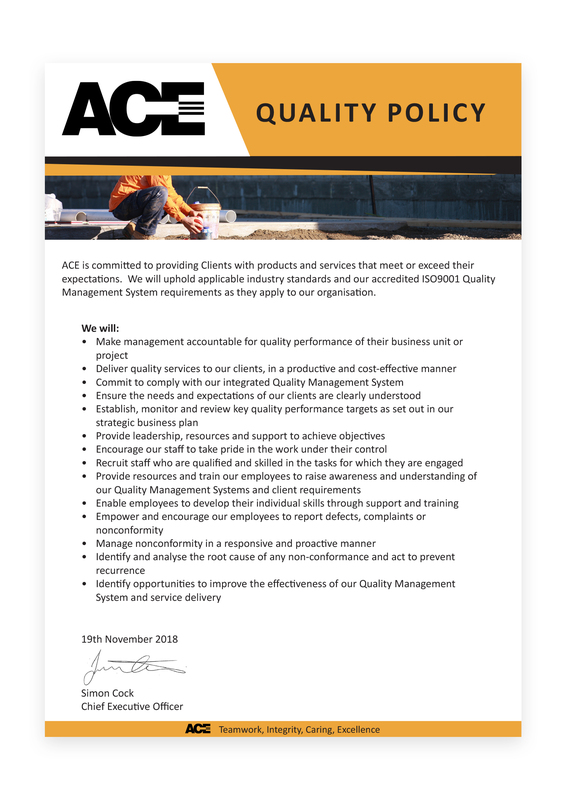 ACE is committed to ensuring that the health and safety of people involved with our business is not adversely affected by our operations through strict compliance with relevant state legislation, requirements of our accreditation under the Australian Government Building and Construction OHS Accreditation Scheme, associated Codes of Practice and the requirements of our accreditation to AS/NZS 4801:2001 Occupational Health & Safety Management. 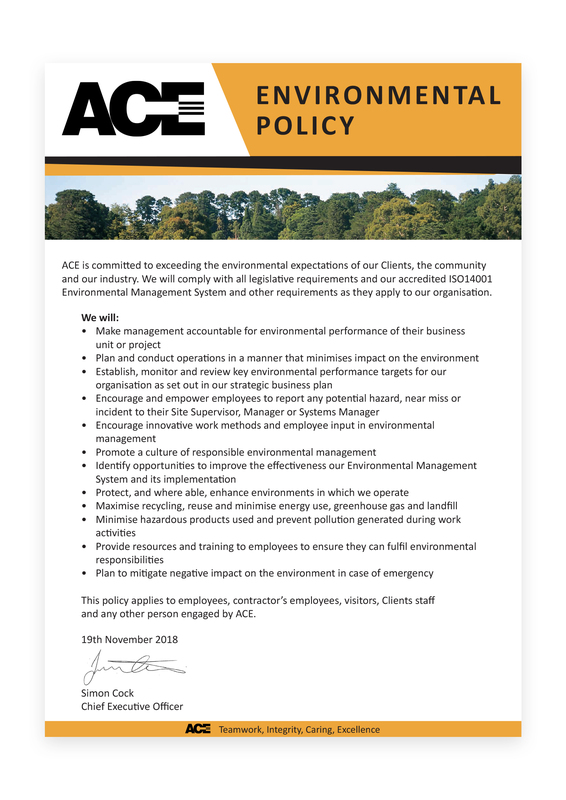 ACE will seek to meet or exceed the environmental expectations of our customers, the community; ensure compliance with legal requirements and our accredited AZ/NZS ISO 14001:2004 Environmental Management System. Our diverse range of service, construction and waste management activities are planned and conducted in a manner that minimises the effects on the natural environment, and are consistent with the principles of sustainable development.